Town situated in the government of Suwalki, Russian Poland. The Jewish community there, like the town itself, is of comparatively recent date. At first the community was dependent, in communal affairs, upon the neighboring town of Kalvariya. Its first rabbi, Ḥayyim Shershaver, was elected in 1780, though the community was too poor to build a synagogue; and the rabbi then visited a number of towns in order to collect money for that purpose. 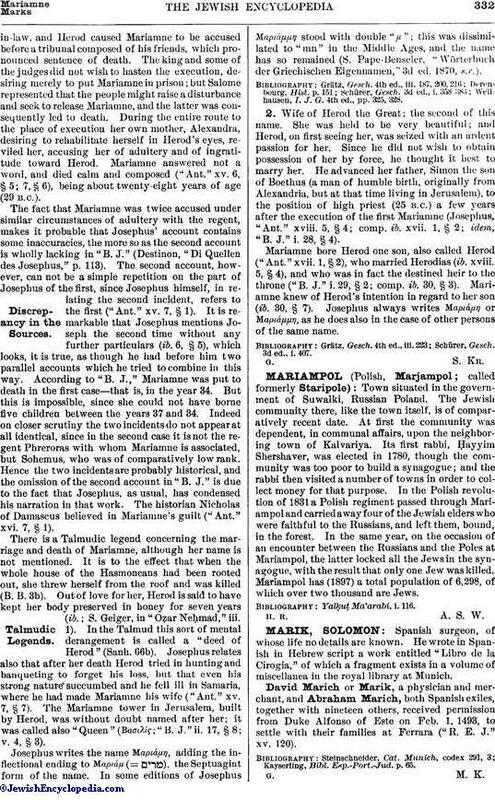 In the Polish revolution of 1831 a Polish regiment passed through Mariampol and carried away four of the Jewish elders who were faithful to the Russians, and left them, bound, in the forest. In the same year, on the occasion of an encounter between the Russians and the Poles at Mariampol, the latter locked all the Jews in the synagogue, with the result that only one Jew was killed. Mariampol has (1897) a total population of 6,298, of which over two thousand are Jews.